If you are a Joomla! Developer, you may now create a separate Joomla! developer page for your business. JoomlaHacks has 200,000+ members who are your potential clients. Creating a page and posting your product will help you get more exposure and sales for your business! Members of JoomlaHacks can follow your developer page. 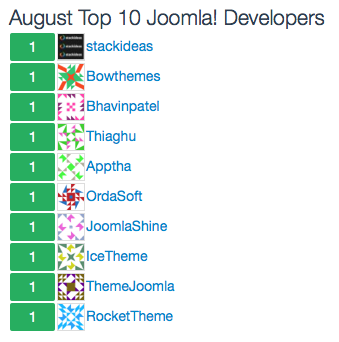 Every month, the developer page that has the most followers will be featured on the "Top 10 Joomla! Developers" section on the frontpage. Signin and create your Page now! This is a really nice site feature. I would suggest that members be able to write feedback about the developers. @RickRoss: We will working on this feature. Thanks for the suggestion. This is really helpful to the Joomla! Developer community. @Rina: It is. We just want to help fellow developers to get more exposure and to help users find the right developer.